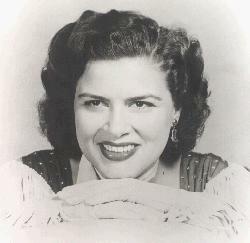 Born Virginia Hensley and referred to by her family as "Ginny", Patsy Cline displayed a talent for performing as early as the age of 4, when she won first prize in an amateur tap-dancing contest. It was not long afterward that she transferred her enthusiasm from dance to music, and for her eighth birthday Ginny's mother bought a piano to provide her with a means to develop her natural musical skills. By her early teens she was singing in the choir of the family's Baptist church and on her own at the local radio station. At the age of 13 the young girl's life was nearly brought to end by an attack of rheumatic fever, which forced her to spend a period in an oxygen tent; she would later attribute the quality of her voice to the throat infection that resulted from her illness. Two years later her father abandoned the family and Ginny was forced to drop out of school, taking night jobs singing at clubs in addition to service jobs during the day in order to help pay the bills. Despite these hardships Virginia Hensley remained dedicated to her pursuit of a singing career, in which she received the steadfast support of her mother. After gaining exposure through several local talent contests she was invited to join the orchestra at the York Inn in 1948, followed later in the year by an opportunity to audition for the Grand Ole Opry (an opportunity that initially amounted to nothing due to her status as a minor). It wasn't until 1952 that things started to fall into place for the singer: it was at this time that, after landing a job at the Brunswick Moose Hall, she first adopted the stage name Patsy. Early the next year her marriage to Gerald Cline provided the other half of the name by which the world would come to know her. A record contract was secured in 1954, but unfortunately it was with a complete parasite named Bill McCall. A series of ineffectual singles ensued before at last the song Walking After Midnight (1957) provided the breakthrough she needed. A performance of it earned her a victory on The Arthur Godfrey Talent Show and the subsequent single release climbed high into the charts. 1960 turned out to be the magic number for Cline: by its arrival she had already traded her miserable marriage for a happy one, bore her first child, come to the end of her contract with bloodsucker McCall, and gained full-time membership with the Grand Ole Opry. That year also featured the release of her crossover hit I Fall To Pieces. 1961 had more trials in store, however, and the singer was given her second near-death experience when she and her brother were involved in a head-on collision while driving in Nashville. Cline was thrown through the windshield by the crash, and received a life-threatening gash across her forehead and a dislocated hip. While recovering in the hospital afterwards, she heard a tribute sung for her on the radio by up-and-coming singer Loretta Lynn; the two meet soon afterwards and immediately became close friends. After recovering from her injuries, Cline came back with another significant hit in the form of the song Crazy, and participated in a well-received showcase at Carnegie Hall in November. Her career had now far surpassed all of her expectations. While Crazy ascended to #1, the singles She's Got You and Imagine That both took their turns on the charts in 1962; an extensive tour was undertaken at the start of that same year, followed by an appearance on American Bandstand in February, and a 35-day headlining gig in Las Vegas that November. In the midst of the enormous popularity she now enjoyed, Cline experienced a premoniton that it would all be over for her soon and gave friend June Carter instructions on how she wanted her children to be raised when she was no longer around. After a benefit concert in Kansas City in March of 1963, Patsy Cline was killed when the plane flying her home crashed near Camden, Tennessee.